Organic mint oil infused 70% dark Belgian chocolate 60g bar. All our ingredients are natural, organic where possible, and our couverture is Forest Alliance and UTZ certified. This also comes in a sugar-free option. It is sweetened with Maltitol and has no bitter aftertaste. Safe for diabetics and dieters alike, it is a great alternative for those steering clear of sugar. The Chocolatiers are a handcrafted, small-batch chocolatier company, based in Linden, Johannesburg, South Africa. We pride ourselves in using 100% plastic free, compostable, recyclable packaging. We live in a world which moves at the speed of sound and realise that we can make your life a little easier. We take the hassle out of gifting or giving yourself a treat. 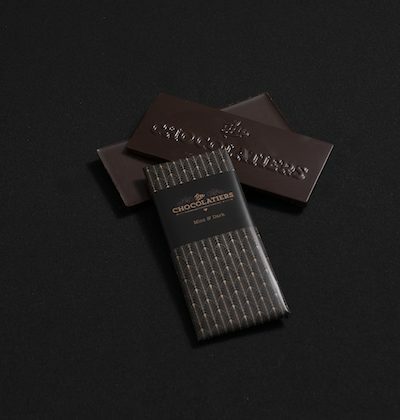 Shop online and we’ll deliver exquisite handcrafted chocolate, beautifully wrapped, with your handwritten message. We use the finest Forest Alliance and UTZ certified chocolate, so that we can bring to you chocolate fairly sourced, placing value on the chain of people from the farmers to the pickers. Local, ethical, Halaal & Kosher certified, Proudly South African, UTZ certified AND convenient. Our flavours are all natural – no fake colourants or flavourings here. We use real berries, real lemons and chillies and real coffee, and for this reason, our chocolates are fresh and preservative free – just as all good, slow, fresh food should be! Where possible, our inclusions are certified organic. Here’s to many happy mouthfuls.